Travel Feature: Tuscany. In a Camper. I’m in Tuscany. But other than the fact that I managed to scrump three figs, and take another four off of an old lady in the street, I shall not bang on about the food. 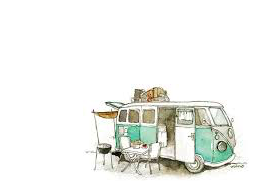 What is infinitely more interesting is travelling in a camper van. It’s on loan from the in-laws. So we’re in a campsite that is brim-full with Dutch and German campers. We could be in Nijmegen, except that I can’t see anything for olive trees. I promised I wouldn’t bang on about food. Except this one other thing: here I am serving up some ravioli with pesto. Frowned upon, I’m sure, by anybody from Liguria (and wherever the hell ravioli is from). But anyhow, that’s what I’m doing. And I’m doing it in the confines of the camper van’s cooking area. Which is too small. So I turn, knock the saucepan against one of those crappy cupboards with the pop out handles. The ravioli goes everywhere (it has nowhere else to go). And I spend the next 20 minutes trying to clean up my mess with a toothpick. So, trying to ignore the bits I can’t get to, I go to leave the camper. In the process I knock the tap (placed at perfect elbow height as you try to squeeze your way out of the kitchen). Off it goes. The whole place gets soaked and my girlfriend chucks us one of those looks. I hold my arms out, palms facing heaven. We sit down on one of those rickety fold away tables with the one leg and eat the remnants of the pasta that I managed to scrape from the riveted draining board. We are all – my girlfriend, daughter and I that is – facing in the direction of travel. Except we are of course stationery, so that’s pretty inconsequential. And the curtains were drawn, or at least held together by a slither of Velcro, to stop the last bit of sun from ruining our day. ‘Tomorrow,’ I say, during my second and penultimate mouthful of pasta, ‘…a barbecue.’ It was the first thing any of us had said all meal. The in-laws had loaned us a rusty old grill on legs. It could barely stand on it’s own feet but the congealed ash from many a summer seemed to just about hold it together. It would be fine. Just then there’s a hello. Somebody was approaching the van. It was our neighbour with the pristine bedouin tent and the posh bicycles. It’s always the man that gets sent for stuff. And when you’re in a camper, people expect you to have stuff too. Bottle openers. Matches. Awnings. I had a bed that was so short that I was forced to spoon the side door-handle. Other than that, nothing. So we sent him away, all three of us, staring at him from the dining table. A little later I’m sitting out under the stars doing some fresh air thinking. Actually, I’m polishing off my fourth large bottle of Peroni and nattering away to myself. I watch a plane go past overhead. I imagine an American guy looking down and going, there isn’t much down there. We must be going over Africa or something. And it was true. There isn’t much down here. I can see the stars. But once I realised that all I could pick out was The Plough, I got to thinking about camper van showers. And toilets. Why? Stock piling the family’s excrement in the confines of a small vehicle, to wash it down with blue hair dye. On that. Earlier I had to empty out the waste water pipe. It had been festering for weeks. You have to empty it into a special little grill. You see signs for them as you are driving about. Mostly you miss the turnings, but anyway, when we did eventually spot one in time to veer to the right I rolled my sleeves up and took a deep breath. The stuff stunk as it came out. It was around 5pm so I got bitten to buggery by mozzies. You can’t walk up to the local town. The roads aren’t illuminated and that’s dangerous with a small child. So, short of options, you go to the campsite restaurant. Here couples of all ages (but not below forty) sit and whisper the odd disparaging word at one another. You leave the restaurant with this obsessive paranoia. And there is the Italian waiter that only talks to tipping nationalities. He showed us no mercy when he realised I was with an Italian. So when he turned his back I did that thing where you raise a fist rigidly into the air, and slap the palm of the other hand between your biceps and inside elbow. Another one of those looks. He may well have heard the slap of skin but it doesn’t mater. She said that his Pasta al Pesto was too salty. Cocksucker. But there’s one thing I do love about camper vanning. It seems that the rule about unbolting yourself and moving freely from front seat to seat is void. My girlfriend happily throws herself around – dishing out food, sticking the dummy in the little one – as I’m negotiating a lorry takeover at 98kph on a wet autostrada. Probably best. Like turbulence on a plane, you don’t notice how bad it is when you’re standing. I said I wouldn’t go on about the food. But I ate the best tomatoes ever in a bar in that small mediaeval town with two world famous ice cream shops. ‘Grown on an allotment,’ the Barista told me. They had a kilo of salt on them which helped. There is a reason I have to tell you this. There was in fact a reason I had opted for tomatoes and not my usual mediterranean daily intake of cured meats and Montepulciano. This reason was my big toe. Which had become so painful that I spent two hours sitting on the incline of Piazza Del Campo in Siena, while the family explored. Some Asian tourists took my picture. Turns out I’d ‘contracted’ gout. At least that’s what everyman and his canine prescribed to me. Even the doctor. Although I didn’t actually see him myself because it cost fifty euros, so I sent my girlfriend in with a picture of my swollen big toe. Word somehow gets back to the in laws. It always does. So that night I receive a call from my girlfriend’s Grandfather. As ever, he was full of advice. It was the almond in my cantucci. So we drive home. Back to the in-laws. Me trying not to press too hard on the pedals to aggravate the condition. I have to say though – in reflection, I’d do it all again. Should you ask your copywriter to mind their ‘ands’ and ‘buts’?